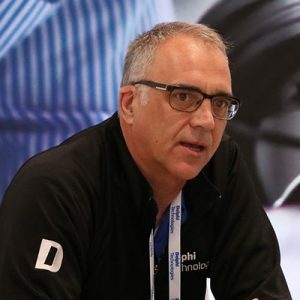 John Kirwan is Delphi Technologies’ advanced research and development chief engineer reporting to the company’s chief technology officer, Mary Gustanski. Based in Troy, Michigan, Dr. Kirwan is responsible for management of the company’s advanced product development, including the deployment of advanced systems projects that support current and future market trends toward reduced emissions, increased electrification and powertrain optimization for connected and automated vehicles. Previously, Dr. Kirwan served in advanced engineering in the Powertrain Systems Division at Delphi Automotive from 2008 through 2017. As chief scientist, and then later chief engineer, he was responsible for advanced technology development and working with the global team to ensure a robust portfolio of future powertrain products. Dr. Kirwan began his career with the company in 1989 at General Motors Research Laboratories (GMR). While at GMR, he was a member of the Fuels and Lubricants Department, where he conducted research on fuel effects on combustion, emissions and performance with gasoline and alternative fuels. In 1999, Dr. Kirwan transferred to Delphi Energy & Chassis as a member of the advanced engine management systems team. During this time, he served as technical leader of Delphi’s reformer development program. This program focused on development of on-board reformer technology to generate hydrogen-rich reformate from gasoline and diesel fuels to enable advanced combustion strategies and emissions reduction solutions. Dr. Kirwan holds a Ph.D. in mechanical engineering, earned at the University of Illinois at Urbana-Champaign. He was certified in February, 2012 as a Design for Six Sigma Black Belt by ASI Consulting Group, LLC. Dr. Kirwan is a member of the Society of Automotive Engineer (SAE), and serves as a member of the SAE Motor Vehicle Council. He is the author of more than 30 technical papers and invited presentations. He also holds 21 automotive-related patents and is a member of the Delphi Technologies Innovation Hall of Fame.